We use state-of-the-art Produce Traceability Initiative (PTI) software that complies with federal Bioterrorism Act provisions and exceeds Food and Drug Administration standards while utilizing both Barcode and/or Radio Frequency Identification (RFID) to ensure stringent identification and tracking. We are a Primus Labs Certified Distributor and undergo annual food safety audits conducted by Primus Labs. All products that we receive are identified, inspected and labeled with Barcode and/or RFID for complete traceability. We undergo random United States Department of Agriculture (USDA) inspections and are compliant with the USDA’s Good Handling Practices and Good Agricultural Practices programs (GAP/GHP). We follow written food security protocols and have an onsite Food Safety Regulator to ensure adherence. 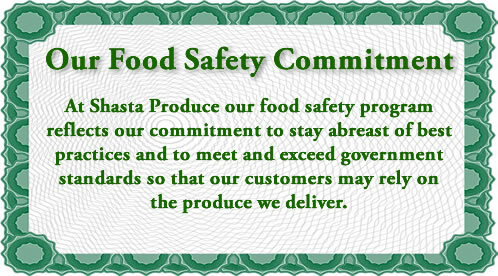 We provide each of our employees with training in Good Handling Practices (GHP) and each has a copy of our food safety protocols. Our employees are also trained to apply Individual Corrective Action & Notification (ICAN) protocol in the event of a food safety violation. All of our trucks are equipped with Satellite Tracking and meet strict Maintenance and Sanitation Guidelines. Our written protocols include: Receiving Product; Labeling and Traceability; Good Handling Practices; Proper Storage & Distribution; Individual Corrective Action & Notification; Transport Security; Emergency Recall of Products; Bioterrorism and Disaster Plans.